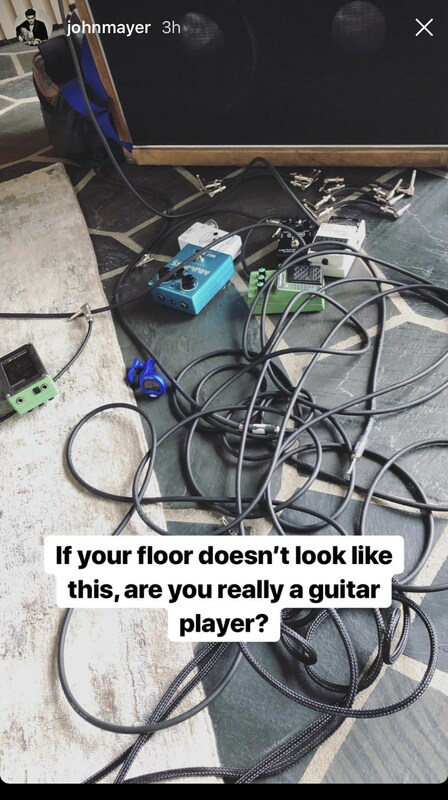 John Mayer posted on his instagram stories: > If your floor doesn't look like this, are you really a guitar player? An MXR M169 Carbon Copy can be seen at 10:00 in his rig rundown, where Billie Joe's guitar tech talks about what effects he uses. In [this mini documentary](https://youtu.be/TgJUUIgTXeI?t=2m25s) about the making of Edge's signature Fender Stratocaster and Deluxe amplifier, we see him testing the pieces together with the aid of a Carbon Copy delay. "Sermon’s BiLT Relevator is finished in shoreline gold and features both an MXR Carbon Copy and BiLT’s own fuzz circuit built into the body along with a Sustainiac in the neck position." -Premier Guitar; Rig Rundown with Imagine Dragons As such, it should be understood that it is built into his guitar, not on his pedal board. "It's just a quick slap delay," says Joe Perry's guitar tech. Pedalboard seen at min. 3:33. "With the Carbon Copy the repeats are a little bit on the darker side. There's a couple of tunes where he'll use the Carbon Copy on where it doesn’t make it so that you notice it so much - it's subtle. The way we have it set is only for like three repeats. For the most part, [Jeff] likes to play very dry, so anything that is going to color the sound like that, he notices too much and it gets in the way," says Jeff Beck's guitar tech. At 2:31 in this video, Za, Synyster Gates guitar tech, talks about Synyster Gates' use of the MXR delay pedal. "It's awesome man, everybody loves those." The Carbon Copy delay pedal is also listed as part of Syn's gear on his [Dunlop Artist Page](http://www.jimdunlop.com/artist/synyster-gates). 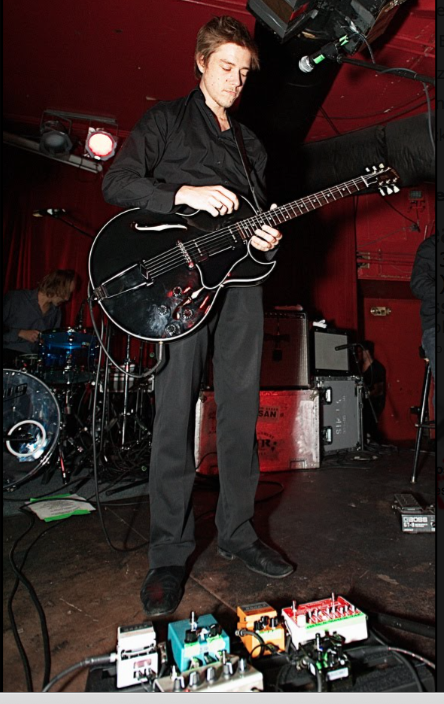 Paul Banks can be seen with an MXR Carbon Copy Delay pedal on his pedalboard in this photo. The MXR Carbon Copy delay can be seen on Ian’s pedal board at (12:15). Zakk Wylde uses an MXR Carbon Copy delay pedal onstage with Black Label Society. "The settings I have it at...are for Randy Rhodes' guitar solos..." Wylde says at (3:40) in this Guitarist Magazine video. "I could be playing fast and it's not going to muddle any of the playing," he said. 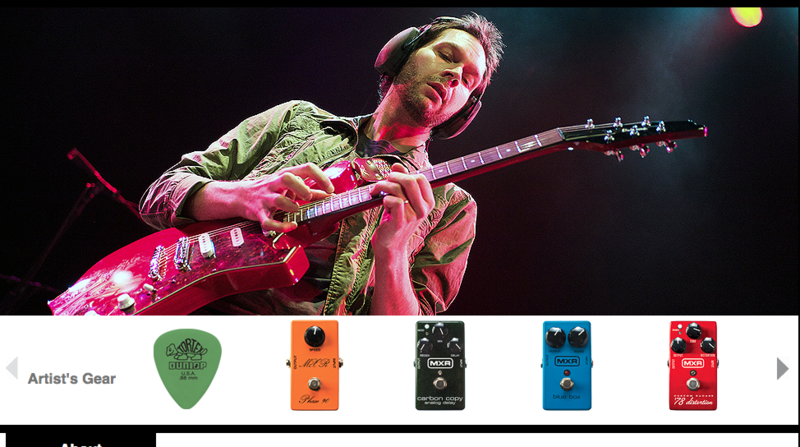 Paul Gilbert uses an MXR Carbon Copy, according to Dunlop's [website](http://www.jimdunlop.com/artist/paul-gilbert). According to [Dunlop's website](http://www.jimdunlop.com/artist/troy-van-leeuwen), Van Leeuwen uses an MXR Carbon Copy. 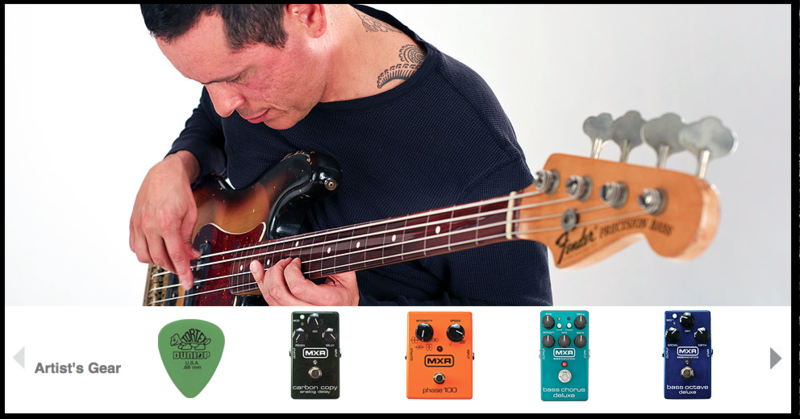 Juan Alderete's gear includes an MXR Carbon Copy Analog Delay, according to [this page](http://www.jimdunlop.com/artist/juan-alderete) of Dunlop's website. You can see her using the MXR Carbon Copy Delay. At 1:35 in this video, an MXR Carbon Copy Analog Delay can be seen on Brad Whitford's pedalboard. This is an Instagram picture of Andreas' pedalboard. The MXR Carbon Copy delay pedal can be seen on the left corner. Monte uses an MXR Carbon Copy pedal, according to Premier Guitar's [rig rundown article](http://www.premierguitar.com/articles/Rig_Rundown_Madonnas_Monte_Pittman). This is probably one of the many delays that Dj Lethal uses. 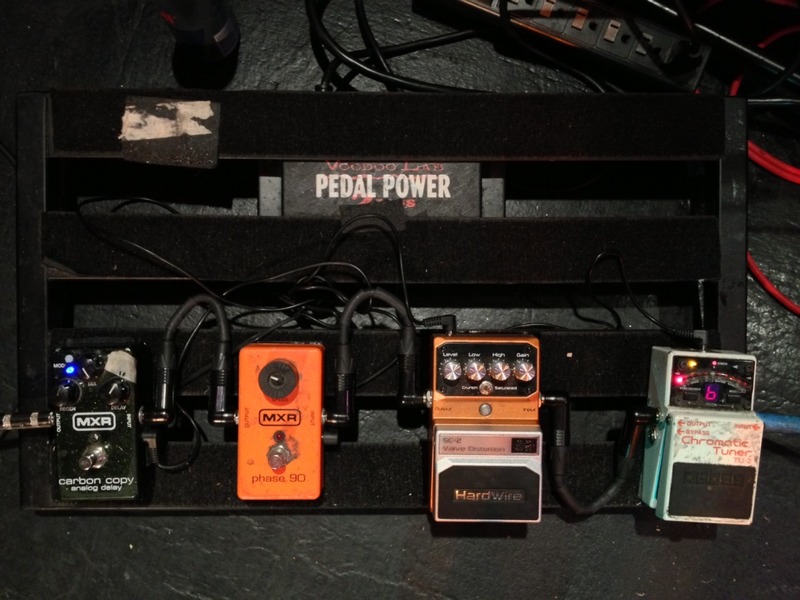 This is a photo of the Pantera, Kill Devil Hill, and Down's bass player Rex Brown's pedal board. You will notice just below the board is the set list for the evening which shows "Devil Hill Music.com" over it's top. You can see a dark green MXR pedal on the bottom of the pedal board. The three buttons on top and 1 stomp selector shows it's an MXR Carbon Copy. In this article by [Vintage Guitar Magazine](http://www.vintageguitar.com/21880/star-board-elliot-easton/?utm_source=Vintage+Guitar%2C+Inc.+List), Elliot Easton's pedalboard is shown as having an MXR Carbon Copy delay pedal before the Line 6 Verbzilla. 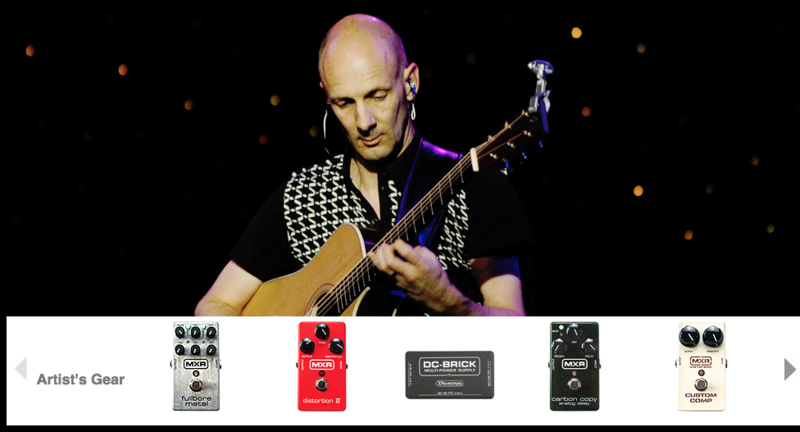 According to Reverb's website, his current list of pedals also includes the MXR Carbon Copy Analog Delay. From Tone King video, explaining his effects setup, with Jeordie and his guitar tech, as a guitarist instead of bassist for Marilyn Manson. 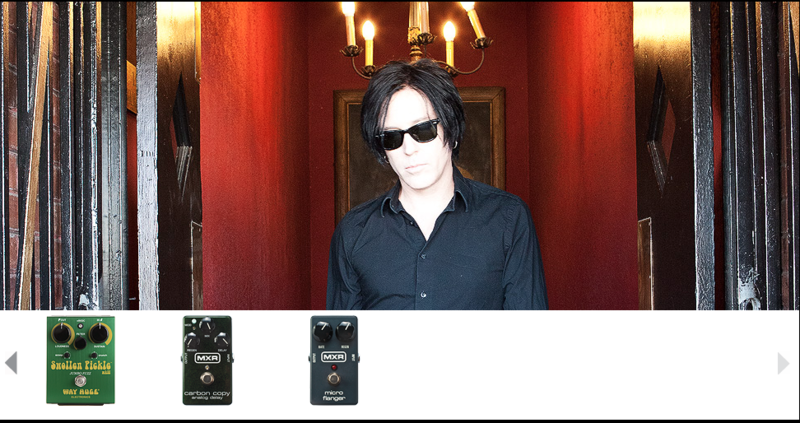 He uses 2 MXR Carbon Copy Delay pedals with different settings in a row for his role as guitarist in Marilyn Manson. In this video, the MXR Carbon Copy can be seen on Fredrick Åkesson's rig at (2:45). In this source video of Guitarist magazine, Scott Holiday is recalling the use of the MXR Carbon Copy Analog Delay. In this interview, Jim Root calls the MXR Carbon Copy Delay, "one of the best delay pedals, ever." (2:20). At 10:23 of this video Zach Blair explains Tim's effect pedal set up, which includes an MXR Carbon Copy Delay. Zach talks about his pedals in this rig rundown video. At 9:55, he says, "I believe it might have been my buddy [Mark from Lamb of God](http://equipboard.com/pros/mark-morton) who said that the Carbon Copy is the best delay and I have to agree with him. To me it's the best delay made." In this photo, some of the pedals can be seen on the floor, including the MXR Carbon Copy delay pedal. 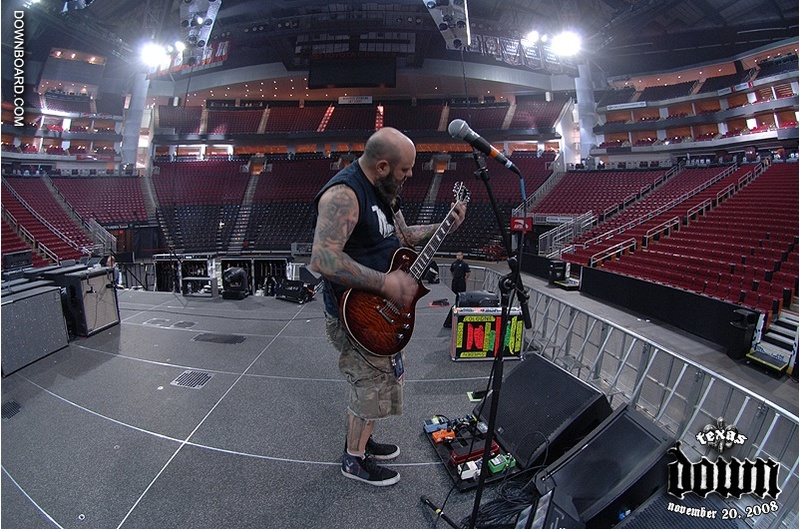 During Judas Priest's Epitaph tour, Faulkner's guitar tech, Adrian, gave a rig rundown. The carbon copy is seen at 7:31 in an offstage rack, in the effects loop of his amp. It's being controlled by a Voodoo Lab Ground Control onstage by Faulkner. 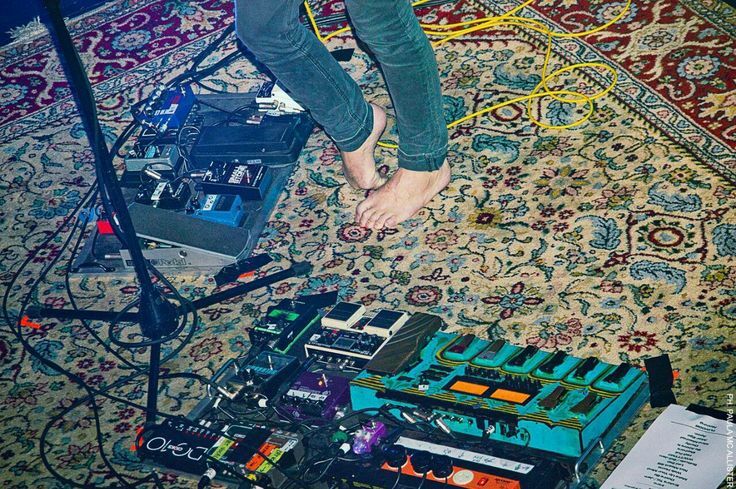 On Kevin Parker's right-hand pedalboard, an MXR Carbon Copy can be seen. 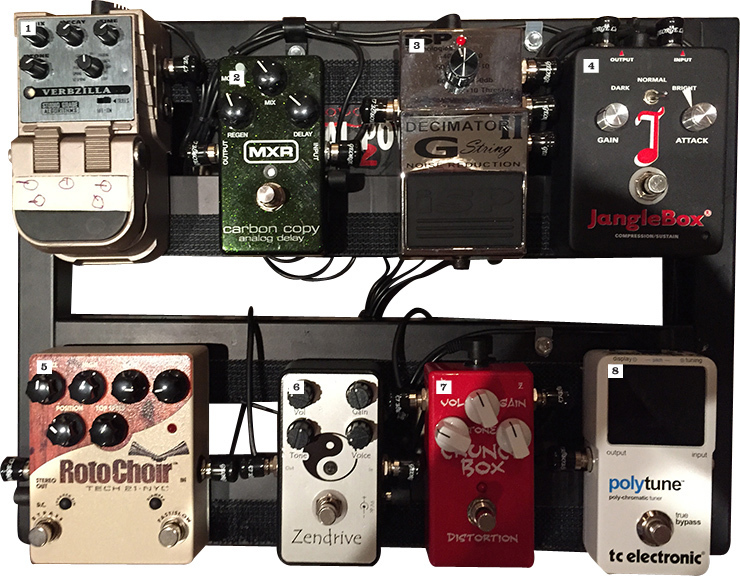 This pedalboard can be seen in [this photo](https://psychexfutureheart.files.wordpress.com/2014/04/11880827-24757692-thumbnail.jpg) as well. Un conocido mio me dejo entrar al SoundCheck del dia de 18 DE MAYO DEL 2016 en Culiacan Sinaloa,aproveche la oportunidad de tomar le foto a lo que pude. 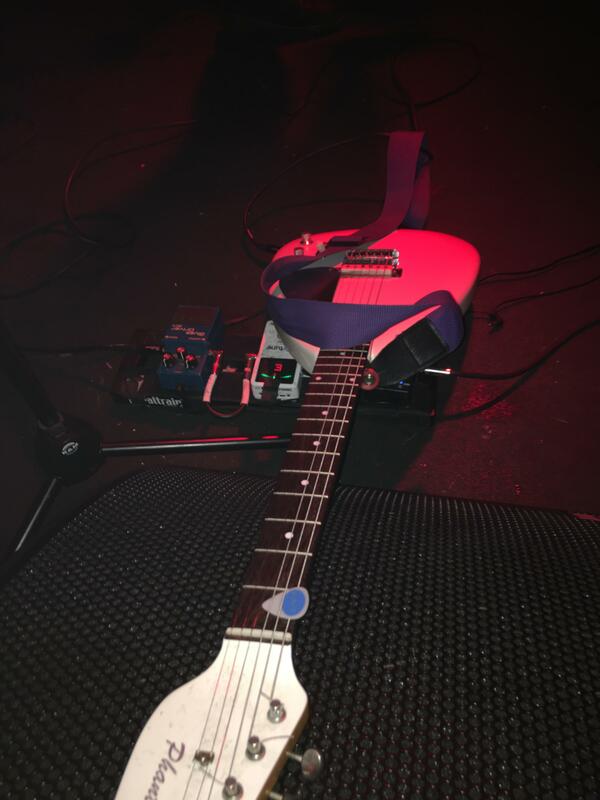 Jesse Keeler's MXR Carbon Copy Delay pedal can be seen in this photo, from Death From Above 1979's Premier Guitar [rig rundown](http://www.premierguitar.com/articles/21712-rig-rundown-death-from-above-1979). Auf der Maur uses an MXR Carbon Copy, according to [Dunlop's website](http://www.jimdunlop.com/artist/melissa-auf-der-maur). This pedal is the second one of the second line. 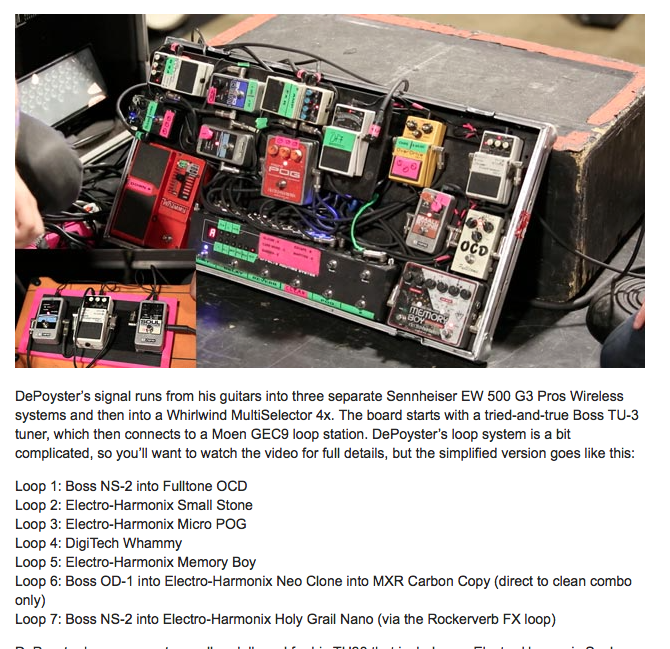 In this interview for [*Premier Guitar*](http://www.premierguitar.com/), Ler mentions he uses three Carbon Copies at once on his pedalboard. He uses the pedal for "Jilly's On Smack". The next pedal up in Todd's rundown [here](http://www.pastemagazine.com/blogs/lists/2012/05/14-guitarists-talk-about-their-pedal-boards.html) for *Paste* magazine is the MXR Carbon Copy Analog Delay. Mr. Moore explains that he has two delays running through his effects loop including the MXR Carbon Copy delay starting at 1:30. At 4:50 John McLaughlin says about the MXR Carbon Copy Delay: "It is really nice on the clean sound"
In this Premier Guitar article Al Di Meola's pedalboard is explained. The pedal on the end of the chain is the MXR M169 Carbon Copy Analog Delay Guitar Effects Pedal. 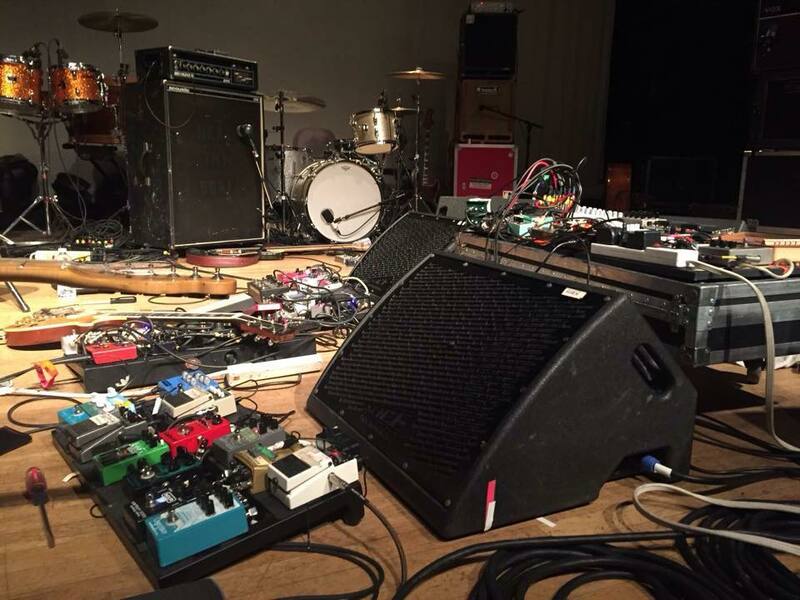 This photo is of Ian O'Neil's pedal setup, from a performance they did in Austin, Texas in Oct 2014. "This I haven't integrated yet, but I just think this is one of the best pedals on the market, it's the Carbon Copy. I use this to record all the time, 'cause you just get, like, trippy chorus echo sounds which I love, they're all over my demos and recordings". – Misha Mansoor on the MXR M169 Carbon Copy Analog Delay Guitar Effects Pedal. Brian Baker use this delay pedal in a Hurley's live session with the "True North" song. At 3:00 of this Rig Rundown for Stephen Carpenter of [Deftones](http://equipboard.com/band/deftones), he shows off some of his gear, including an MXR Carbon Copy Analog Delay. In this [Rig Rundown at Premier Guitar](http://www.premierguitar.com/articles/Rig_Rundown_Lamb_of_God), Mark is shown to have a Carbon Copy in his effects rack. At 7:43 in this Rig Rundown for G.E. Smith of [Moonalice](http://equipboard.com/band/moonalice), [Saturday Night Live Band](http://equipboard.com/band/saturday-night-live-band), [Hot Tuna](http://equipboard.com/band/hot-tuna), and [Hall& Oates](http://equipboard.com/band/hall-oates), displayed is a MXR Carbon Copy Delay. To the left of the phaser pedal is the Carbon Copy by MXR. Listed on Ben's official Dunlop artist page. According the Dunlop Website, Phil Campbell is using the MXR Carbon Copy. I have a Dunlop 95Q Wah in there that’s always connected and a Carbon Copy delay. This is an effect that Jake uses to make is guitar very BIG... This isn't a famous Jake E. Lee Pedal but it's in his pedalboard! What type of delay pedal is it? It’s an MXR Carbon Copy. And for the noise suppressor we use a Boss NS-2 or the MXR Smart Gate. We’re not sure if that’s the best but we’re using it right now and it works pretty well. And the tuner is a Boss TU-3. At 16:05 in this video, Dan Hawkins points out his Carbon Copy Delay, saying, "which is just a really posh, chorus sounding thing that I really like." At 5:11 minute mark, the MXR Carbon Copy is visible in Andrew's rig. In this picture tweeted by James you can see the MXR Carbon Copy delay pedal. Stephen's delay pedal. Photo taken at Copeland's show on 11/23/16 in Seattle. Pedalboard photo posted on instagram (since deleted) shows Super Duper, Carbon Copy, TU-2, and Loud/Louder. 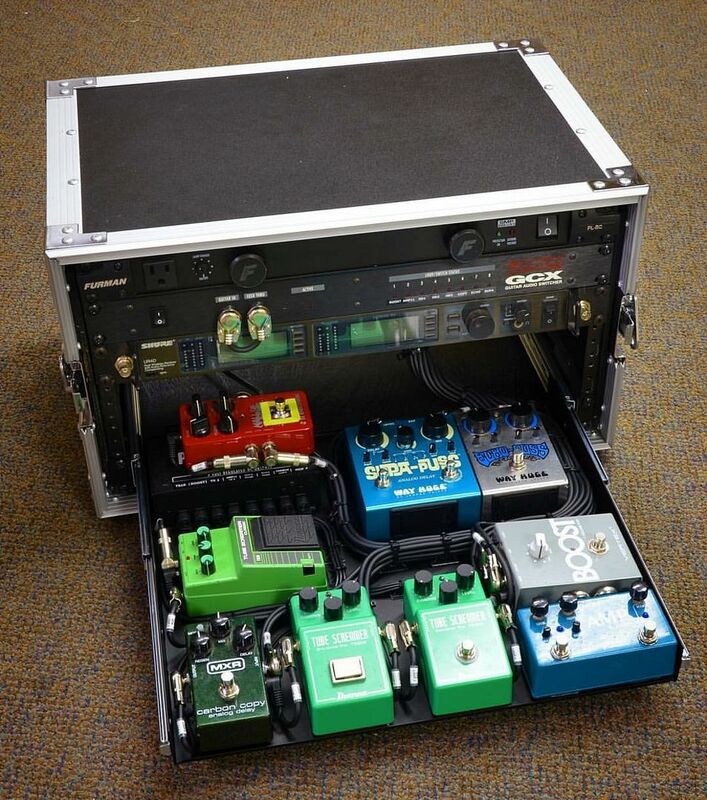 In this picture from this post http://www.voodoolab.com/forum/viewtopic.php?f=5&t=4577 made by Nice Rack Canada who created this pedalboard, we can spot a MXR Carbon Copy Analog Delay. Bert uses an MXR Carbon Copy, according to [Dunlop's website](http://www.jimdunlop.com/artist/bert-lams). We get to hear how Luke uses The MXR Carbon Analog Delay at 21:35. In this photo, MXR Carbon Copy Analog Delay pedal is visible. An MXR Carbon Copy can be seen on Jonathan's board at 2:28 on this video. Richard Zven Kruspe's Carbon Copy is visible at 0:30 in this video. "I use the Dunlop Carbon Copy analog delay. I actually have several, for different settings." 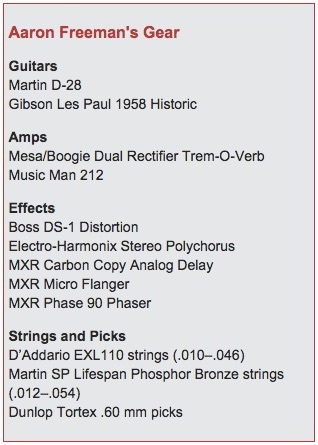 Aaron uses a MXR Carbon Copy Analog Delay pedal per [*Premier Guitar*](http://www.premierguitar.com/articles/21257-aaron-freeman-return-to-form?page=3). At 2:41 Mac is seen using a MXR Carbon Copy delay, mac usually doesn't run a delay. this pedal can be seen on the top of this pic, it's the dark green one. We get a good angle on Becky's pedal board at 2:03 where we can clearly see her MXR Carbon Copy Analog Delay. 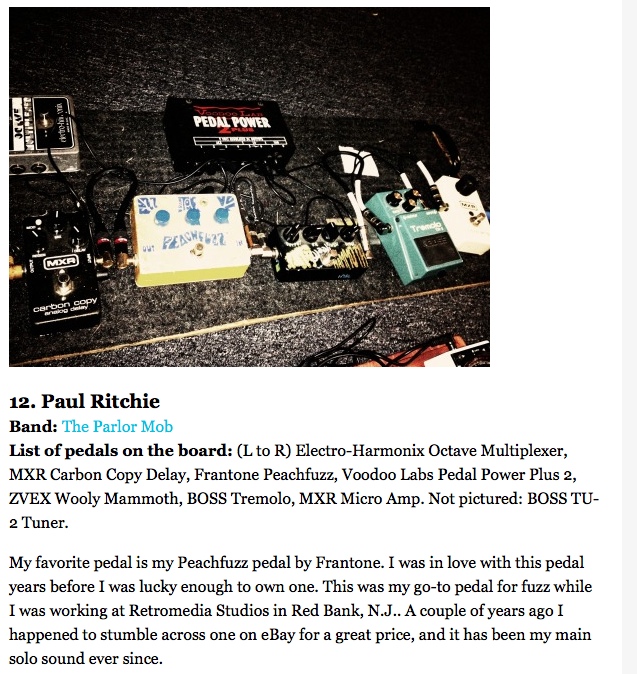 Paul uses an MXR Carbon Copy Analog Delay, according to Paste magazine's [particle](http://www.pastemagazine.com/blogs/lists/2012/05/14-guitarists-talk-about-their-pedal-boards.html?a=1). In This Video He Talks Some About His Carbon Copy. "playing 50's rock 'n roll covers"
As you can tell, Dave Wyndorf leaves all the filth and fuzz to the other bandmembers as gets weird and wild with three delays (MXR Carbon Copy, TC Electronic Flashback, and a SIB Electronics Mr. Echo). According to East's artist page on the Dunlop website, he's using a Carbon Copy Delay. Can be seen on the pedal board. Laura Jane Grace's Carbon Copy pedal is visible at 11:05 in this video. > Feeling pretty blessed to have a set up like this. Using this to demo new prototypes today.. Taking a break for my #teletuesday #telecaster #morganamps #morganRCA35R #gearporn #friedmamps #jj100 #jerrycantrell #seymourduncan @morganamps @friedman_amplifiers @seymourduncanpickups @fenderguitar #thankful testing what?? I will never tell..
in this image , MXR Carbon Copy Analog Delay can be seen. In this photo by Sam, the MXR Carbon Copy can be seen next to the Strymon BigSky pedal. In this Reddit post, Nick states that he uses the Carbon Copy in his chain. At 7:48 of this video, Day's pedalboard can be seen with the MXR carbon copy forth in the chain. 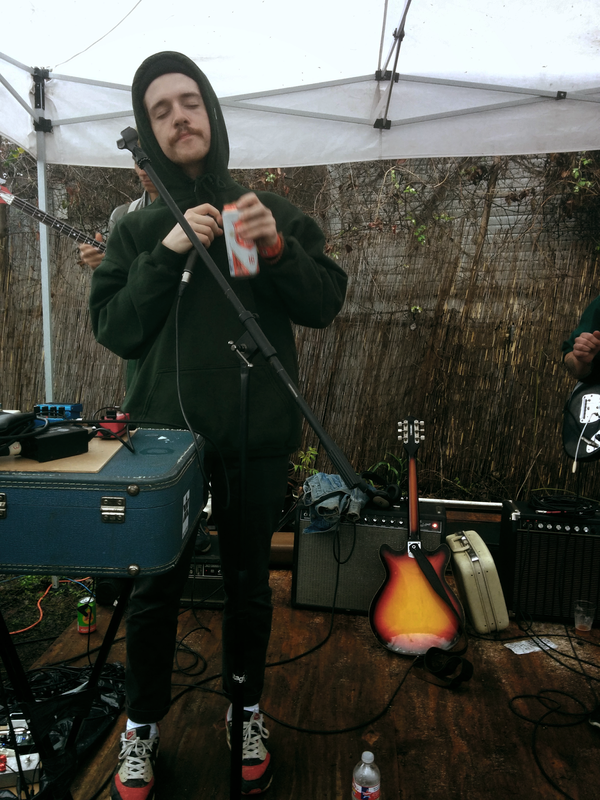 "For effects I use a Peterson tuner, either a Chandler Digital Echo or an MXR Carbon Copy, an MXR Phase 90, a Boss OC-3 Super Octave Pedal, a Morley Bad Horsie Wah-Wah pedal and a Morley Optical Volume Pedal. I’ve also just started using an MXR Micro Flanger which Joe Bonamassa recently gave me." "MXR Carbon Copy for dark, repeating delays. I’ve spent a lot of time trying to find the right sounds. When something becomes three-dimensional, I tend to like it. If it doesn’t make the cut, I’ll carry on looking for and pay for the right piece of gear. I geek out a lot and track it all down!" 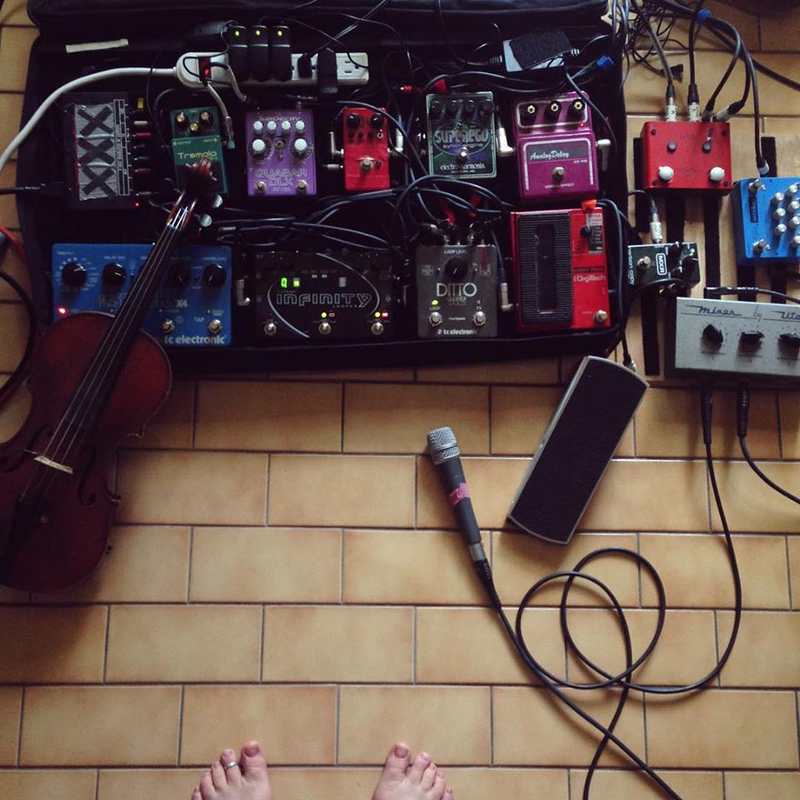 on this picture, Chad Huff shows his pedalboard. In this photo Carbon Copy Delay can be spotted on the pedal board. At 1:53, one can see Kieran's pedalboard. On it a MXR Carbon Copy Analog Delay can be seen. Listed on Marcus' official Dunlop artist page. Pedal-wise, I endorse and I have a Pigtronix Envelope Phaser, a Philosopher Bass Compressor, a Quantum Time Modulator and their Fat Drive. I love MXR’s Carbon Copy Delay, plus their Phase 90, Bass Octave Deluxe, Bass Envelope, and one of my favorite delays that Way Huge makes called the Aqua Puss," says Michael League, in [this interview](http://www.notreble.com/buzz/2014/02/13/from-the-ground-up-an-interview-with-michael-league/) with No Treble. In the comments: I believe it was Rockett Archer for drive and MXR carbon copy for the quick delay, and an old Fender spring reverb unit the studio has. Also I was going through two amps with a very tiny bit of tremolo at different speeds for some extra thickness. The delay might have been EHX memory man ping-ponging between the amps, can't remember now. 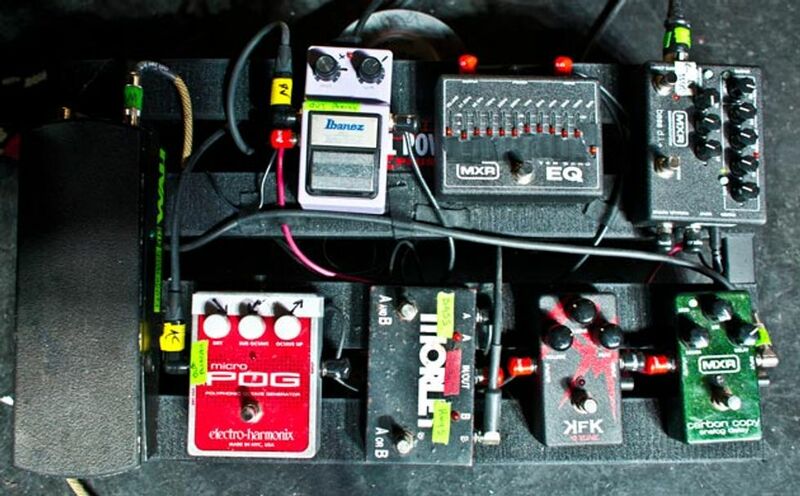 From [Pigtronix' website](http://www.pigtronix.com/artists/ghost/), this is a photo of Water Ghoul's pedalboard. Carbon Copy is on the bottom left side. According to Skaff's Instagram profile, he uses the MXR Carbon Copy Analog Delay pedal. Jeremy DePoyster uses an MXR Carbon Copy Analog Delay, as stated by [this](http://www.premierguitar.com/articles/20659-rig-rundown-the-devil-wears-prada) rig rundown. 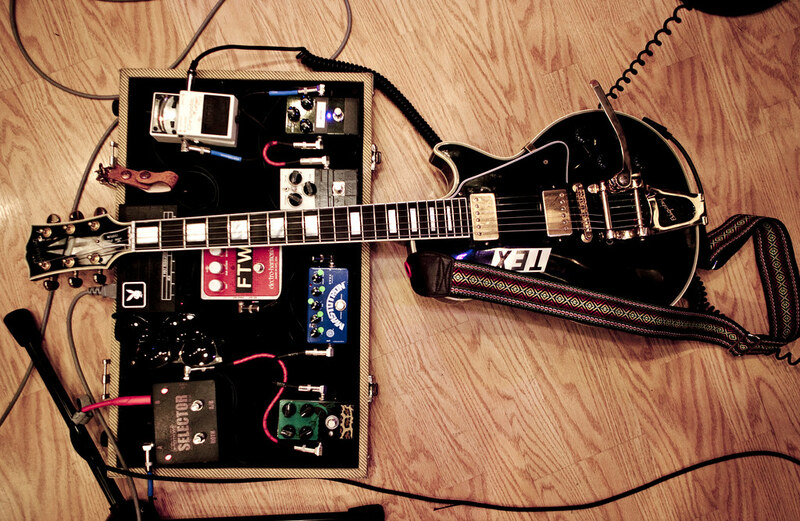 In this photo, from his [rig rundown](http://www.premierguitar.com/articles/20659-rig-rundown-the-devil-wears-prada), Mike Hranica's MXR Carbon Copy pedal can be seen. At 2:29 it shows a close up of Nathan's board he used for the 2016 Summer Is Forever II tour. 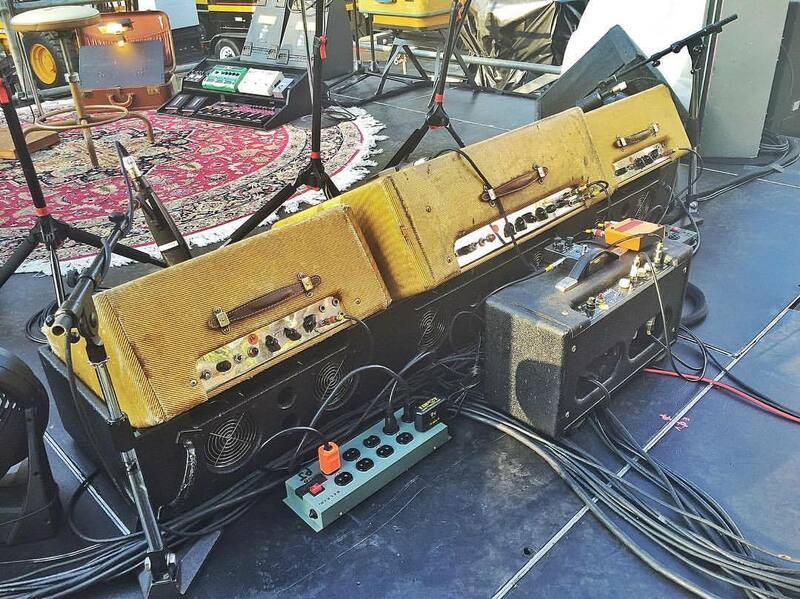 Steve's pedalboard is pictured here. Fender was with Beach Fossils at El Rey Theater and they shared all this on Instagram. You can see the Carbon Copy next to the Hall Of Fame. Dustin uses it for his voice with the Hall Of Fame (he said it in the 'mini interview' at the same day). Screenshot made from Fender's Instagram. "Other stuff used in this video are a Gibson Collectors Choice Gabby, a Charvel So Cal Silver Sparkle, an MXR Carbon Copy Delay..." reads the description of this video. At 20:43, an MXR Carbon Copy can be seen. Its hard to make out but looks for its 3 black knobs. Pete messes around with it at 20:46. Just above the Danelectro is a Carbon Copy by MXR. Just to the left of the Univibe is an MXR Carbon Copy. It's difficult to see, but the colour gives away its identity, as well as other characteristics. "I mean, my pedal board is mostly pretty standard. I’ve got a Boss Tuner, an MXR Carbon Copy, a Boss DD-3 Delay, a Cry Baby Wah Pedal, all standard as. The only off ones are a Devi Ever Torn’s Peaker, which is like my fuzz pedal, which I’ve used since forever." in an interview where he discusses his guitar setup. > *So, summer 2015 tour rig would have been: - 2 almost identical Fender P/Js. One was a store bought model where nothing changed. American Standard with a super thin J neck (me thinks those are the 60s style, but I could be wrong). The other is my Fender master custom P with the Marcus Miller neck. Had a J bridge pickup added. No fancy electronics. Original Badass bridge added. The big deal with that one was the silver flake finish. Took more than a year to wait for the paint job. Nothing is tuned down for good, just a low Eb for some of the songs that need it. - Delay is just an MXR Carbon Copy. I try new stuff all the time and that one just feels so good to manipulate by hand. - Shut Up and Dance fuzz is actually just an old Ibanez bass Tube Screamer. I throw in a JHS 4-Wheeler if it needs more definition. Nowadays, I use an Aguilar Agro or the Brimstone crossover distortion (Best distortion on the market) - The Rick... OH the rick. I miss her. She's SUPER rare. factory turquoise, built in 2001. I don't have the heart to subject her to the road anymore. Maybe in the future I will bring her out cuz gear heads always want to chat about it after the show." 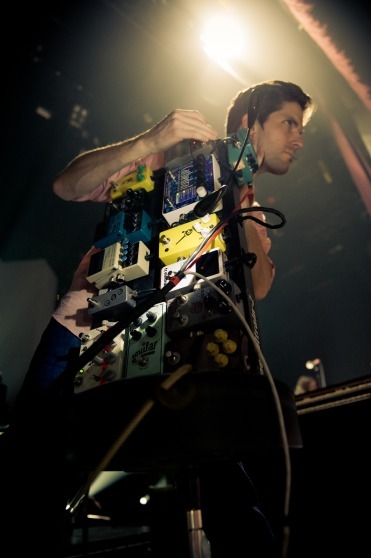 In this photo Daniel Christiansen pedals, it can be seen that he uses a MXR Carbon Copy Analog Delay. An image of Wil's pedalboard posted on Twitter shows an MXR Carbon Copy Analog Delay. According to Fowler's pedalboard photo posted on his official Instagram account, Fowler uses the MXR Carbon Copy Analog Delay. 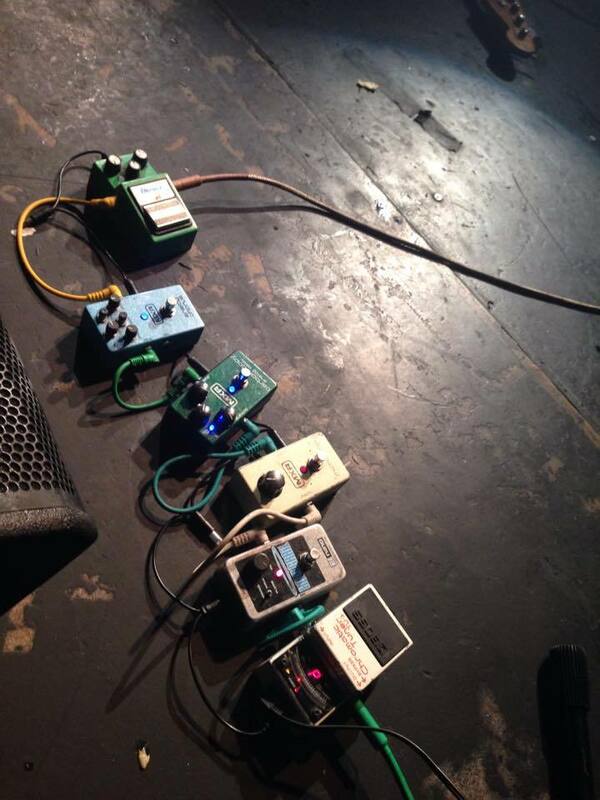 In this picture Max posted of his pedalboard on Twitter, one can see he uses an MXR Carbon Copy Delay pedal. In this reddit thread the submitter says he spoke with Andy after a show about his pedals. The pedal (As well as other equipment) is referenced in this article. 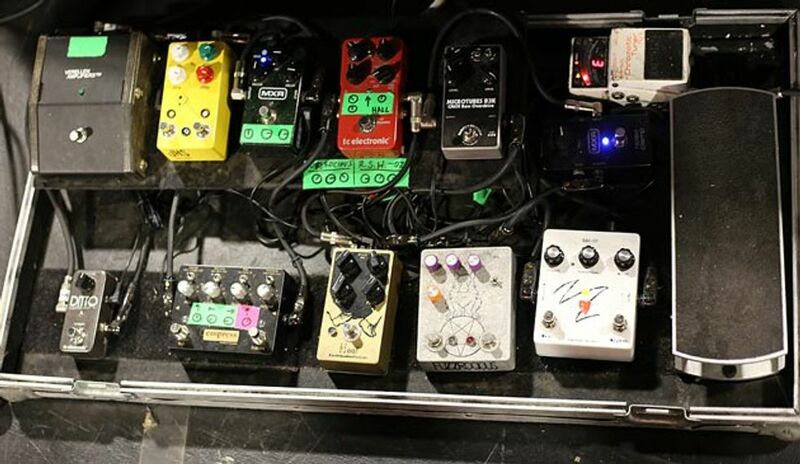 In this Rig Rundown for The Sword's 2014 tour, Cronise has a Carbon Copy at the end of his pedalboard's signal chain. It's the pedal in between the Space Echo and the POG. He uses two and runs them almost like a reverb pedal instead of a typical delay. This is a picture I took at a Highly Suspect concert back in August of 2015. The pedal in the same row as, and right next to the Volume pedal, you can see an MXR Analog Delay. According to Premier Guitar's interview, Gunn uses the MXR Carbon Copy Analog Delay. 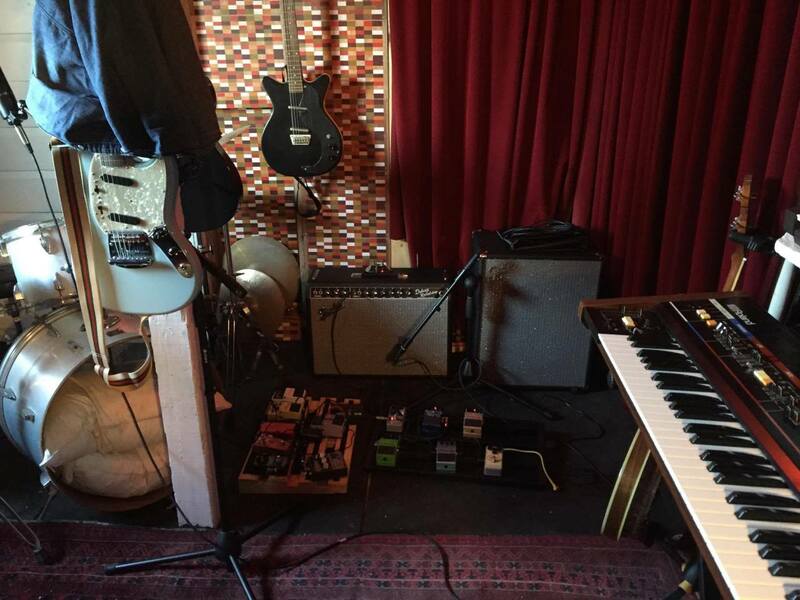 The pedal can be seen in this photo posted by Siouxsie Medley on her Instagram page. The photo was posted on 14th April, 2014. "I don't own many pedals but the Carbon Copy is definitely an essential..."
A MXR carbon copy can be seen at Stu's board. Ben mentions that he uses a Carbon Copy delay. According to Premier Guitar, Ellman uses the MXR M169 Carbon Copy pedal. In the clip Kaleo - No Good (Live at United Record Pressing) you can clearly see the fx-pedals for the guitar of JJ Julius Son : MXR Carbon Copy Analog Delay / Strymon Flint Tremolo/Reverb and TC Electronic Polytune 2 guitar tuner . Can be seen in this video at 3:10 and is also listed in the description. In the bottom left corner, the MXR Carbon Copy Delay can be seen on the ground. I have my MXR Carbon Copy, a good solid delay; easy to use, great sounds. 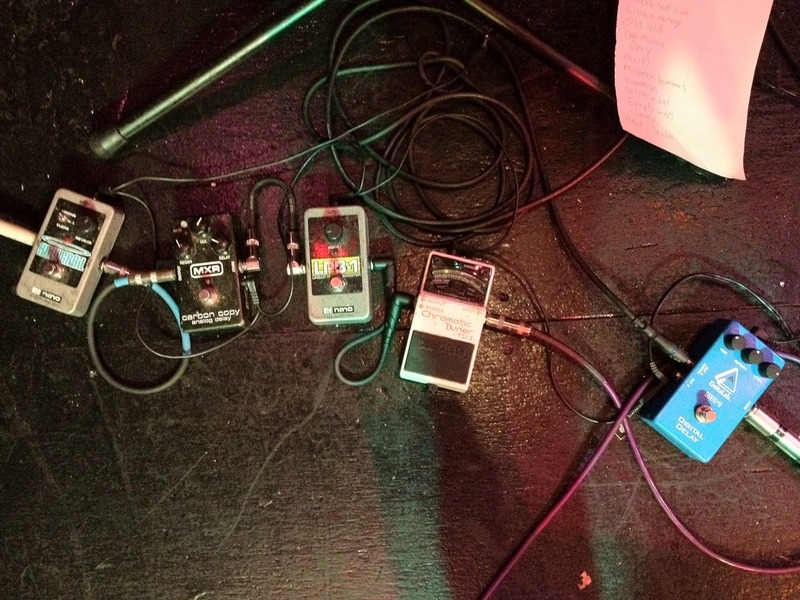 In this attached blog photo, a MXR Carbon Copy Analog Delay pedal is seen in Matt Taylor's gear setup. Although it does not directly show it is his, the cable running out of his amp matches that of the one plugged into the EHX Holy Grail, which is different from Kyle Straka's cable. 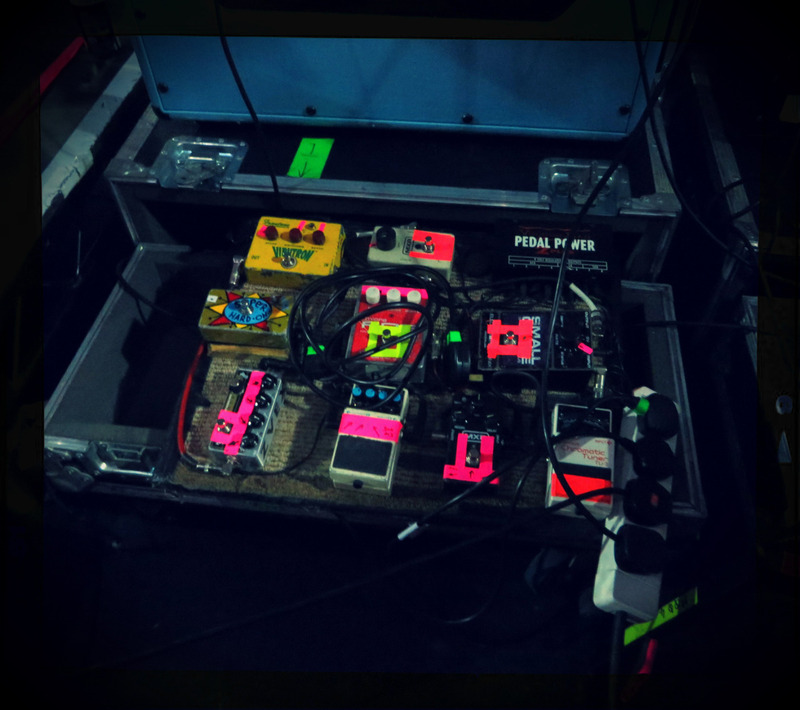 The header of this article features an live photo of the band that showcases Brendan's pedalboard, where this pedal can be seen. Concert from spring of 2016 you can clearly see his pedalboard at the 1:07 mark in the video. 8:30 he said that he recieved it from MXR and he will use it for building a new pedalboard. Took a picture of his pedal board at Amoeba Records. When asked about his gear on Facebook, LeBlanc replied that he would recommend a MXR Carbon Copy Delay. She says she uses an MXR delay, and it's hard to tell but looks like the Carbon Copy. 0:10 - Syu can be seen in the studio with Galneryus, using an MXR Carbon Copy analog delay, a Vox V846 wah, a Boss LS-2 Line Selector, a Boss NS-2 Noise Suppressor, a Boss tuner and a BB King preamp pedal. This video footage was taken at September 10th, 2010 at an MIT Studio in Tokyo, Japan. In Pedals Fusion's 2015 interview with Atsuko Chiba, Kevin showed off his pedalboard, which included a MXR Carbon Copy Analog Delay. According to Royal Thunder's interview with Guitar World, Will uses a Dunlop MXR Carbon Copy Analog Delay. From official website photo. I've seen it used live too. "For pedals, I use a Line 6 DL4, Boss DD-20, MXR Carbon Copy, Strymon Blue Sky & Flint, Ibanez TS808, ISP Decimator II and Hotone chromatic tuner, but am always searching for new sounds!" Max Colbert has a MXR Carbon Copy delay pedal on his pedalboard. Henri's Instagram post displays his entire pedalboard including his MXR Carbon Copy. During her recent tour stop in Chicago, we were able to catch up with Samantha to check out her pedalboard and take a look at her favorite guitars. In this video Rob and Lee each buy a pedal board setup to use for demos. In the process Lee decides to choose a carbon copy delay for his board. This was his favorite delay pedal to use out of his choices. You can see this pedal within the first few seconds and througout the video. Can be seen at 6:34. Erol uses MRX Carbon Copy Analog Delay pedal on his pedalboard. Used beginning with the EP era, recorded with this pedal on all 3 songs. Really fun pedal. I'm fairly certain that this is the pedal board layout I'll be going with in April. "Wedding gig. @nobelspedals @tcelectronic @jimdunlopusa @analogmike_piera @pedaltrain @trexeffects"
Another borrowed pedal that Domhnaill uses in "Nachos Part 2" and "I Hate You". "while my Carbon Copy is my go-to for simple slapback delay sounds." Mike shows his Carbon Copy on his pedalboard at 1:16 in this video. Says "Carbon Copy" in the video. Here Jacob says he uses the MXR Carbon Copy. He uses that effect with Caveman. 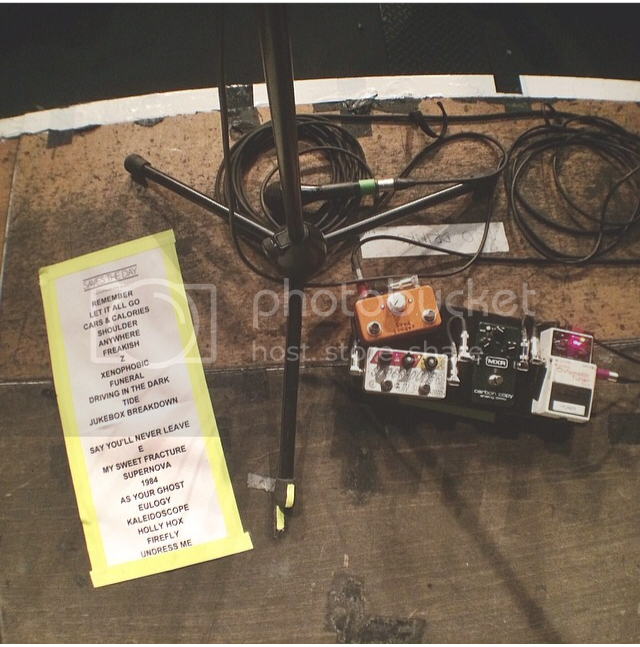 Seen on Tanners's pedalboard in various photographs found on the blog in the URL. This thing is so gritty and dark. It just has the most amazing character to it. Perfect for pairing with clean digital delays. I would never do a gig or session without it. The self oscillation is gnarly, and it makes a great slapback tone. I wish it had a more modulation. Hello! By opening the back panel there are two knobs to change the modulation, but I haven’t tried it. MXR's Carbon Copy delay, while only having been out for a few years, is a great delay for dark echo fans. The oscillation you can get with this delay is amazing, similar to Radiohead's "Karma Police" effect near the end of the song. Great delay for the money, I recommend you get one now! Great sounding pedal that is not noticeable unless it's not there. Does that make sense?? I bought this pedal because of the price and some great reviews and YouTube shoot outs. I play an American Strat into a Fender blues deluxe. I don't think this pedal is as versatile as some of the other digital delays but it does deliver a nice mellow analog delay to complement a clean or dirty signal. From slap back to spacey delays, this pedal delivers. It is nice to see the list of professionals using it getting larger too. Everything about it is great. Usually i don't like the narrow sound of mxr guitar pedals but this one really suprised me and as i tried it for the first time i told the worker at the shop that i was going to buy it. At the end, of course i ended up buying it despite it's high price that left me with 100 bucks approx. What i can say is it has it's own unique sound that no other analog pedal can reach. My suggestion is to buy it because you'll never regret it. The carbon copy is a very common pedal, thanks to the price and quality. It was my first pedal and is still here with me! I use it in the fxloop to fat up my sound, because is anolog and very dark sounding,sometimes to hear the repeats the only thing to do is to play in palm mute otherwise it will completely blend with the dry signal. So i dont use it as my main delay, i use it to put some very good make up to my clean sound and a mistic vibe to my crunch sound. Great pedal but if you are looking for a crystal sounding delay this is not your pedal. Great pedal! The "Modulation" button adds a tasty warble which can be dialled in with some internal trim pots. Manipulating the knobs while playing offers up some crrraaazy tones. The Best Analog Delay Pedal on the planet. I got this as a gift from my wife. it's an awesome analog delay. best part of the delay is the mod switch that adds more spacey feel to the effect and the pedal can oscilate if regen knob is to full and you can play around with delay knob for different sounds. KUdos to your wife, mine says will gift me a Deluxe Reverb... duh, lets see. Can make even me sound huge! it's fun to twiddle and also useful. I have it on a lot, but usually set kind of light; that is, fairly short delay, few reps, light mix, and almost never push in the "Mod" button. I just don't like the way that sounds. Amazingly beautiful sounds, from quirky slapback to dreamlike delay soundscapes, organic feeling that doesn't alter the core of your sound and on top of that a mod button that gets you even further. I was amazed by how naturally this pedals sits in the mix with a full band and also how it plays well with other pedals. I Remember The Day I Got This Pedal.. I Plugged It In, And Realized That I Plugged It In Backwards. Then Plugged It In The Right Way, And It Still Didn't Turn On! Then I Realized I Needed A Power Source. (The Carbon Copy Was My First Pedal, As You Can See) Roughly A Week Later, I Plugged It In, Turned On, And Produced Echos, And I Though. Wow, What A Waste Of Money! I Was So Mad, After All That I Was Disappointed With The $116 Dollar Guitar Toy That My Parents Had So Generously Given To Me. I Was So Frustrated I Gave Up On The Whole Day, And Went To Sleep Hoping To Wake Up, And Find That I Had Gotten A Tubescreamer Instead, And That The Carbon Copy Was A Bad Dream. I Just Couldn't Make The Pedal Sound Good! Finally, A Good Year Later, I Had Finally Mastered The Way Of The Carbon Copy, Making Sweeping Spaceship Noises, And Having Lush, Beautiful, Inspiring, Other-World-ly, Delay Tones. I Realized That If You Know (Or Learn) How To Use This Pedal, It Can Be A Very Inspiring, Creative, Though Provoking Pedal, That Can Move You To Become A Better Guitarist, And Make You Fall In Love With The Guitar Again, And Again. These Words Are True. I Have Had No Problems With The Carbon Copy (Except For Plugging It In Backwards). It Doesn't Hum When It Runs On Batteries Like My EHX OD Glove Does. The Only Problem You Could Really Come Across Is If You Want To Sound Like "The Edge", Then Get A Digital Delay, Or The Carbon Copy Bright. I've Found That If You Set The Settings Right, It's Very Easy To Make This Pedal A Chorus Pedal Too. Though If You're Looking For A Chorus Pedal, I Recommend Chorus Pedals For Chorus Pedals. Anyways, Great Pedal. I Love It. It's Amazing. please, rewrite your review on the right page. It's MXR Carbon Copy. This page is duplicated with the wrong pedal name. Oops! Sorry! Carbon Copy! Gah! No Carbon Cop! Sorry! I merged the duplicate item into this one, so now it's all good! Warm saturated delay that can oscillate like crazy, or add the perfect amount of slap. Mod switch warms it up even more by adding a chorus effect on the repeats, somewhat simulating a tape echo. I love this little guy. It was between this a Memory Man and a TC Flashback. This was the winner for me. It feels like its built like a tank. Simple as hell to use. Gives a really nice dark natural sounding delay. Best of all very reasonably priced. dreamlike delay tones that go for days. I can sound like anything I want to. This thing does everything. Its probably the greatest pedal of all time, EVER. Ive had it since 2011 and I still haven't figured out everything you can do with it, not even half way, its constant sonic exploration. I love recording with it and playing live it always gets people's ears perked up cause its a beautiful sound whether long or short, wetter or more dry. A great pedal for swells. The mod on it is brilliant. I use it exclusively for heavy ambient songs. It doesn't have a tap tempo so it makes its use very limited, but its sound is amazing. I used other delays before getting to the Carbon Copy. It really caught me with it´s sound and since then I own one, got rid of the others, and have been using it every time I get a chance. I honestly think that anyone who likes to use delay effects should give the Carbon Copy Analog Delay a chance! All the way from slapback to long stadium-like repeats, self modulating possibilities, and even a chance to adjust how the modulation affects the delay itself. Capable of giving any classic tone but also an ambient style that inspires more and more! Sounds great, three easy knobs. I simplified from a feature-laden digital delay. I miss the tap tempo. but I don't miss all the futzing with knobs to get the sound I want. Stupid easy to use and sounds great. A relatively short delay time and regen setting with the modulation adds a wonderfully subtle shimmer to chords and arpeggios. Always on. I've always been a huge fan of digital delays... until I got CC in my hands. As soon as I discovered beauty of warm & dark repeats, I sold all my digitals. This is the only delay unit in my setup right now. A must have in guitarist's pedalboard, really. Best bang for your buck and you won't find another like it! Great analog delay. Worth the hype. Relatively affordable compared to some boutique analog delays that do the same exact thing. In some cases, not as well for even more money. It's the pedal that will do the delay job well. I originally had a BBE Two Timer which was nice until it broke. I floated around a few mini pedal pedals (like the Donner Yellow Fall, etc.) until I ended up with one of these month ago. I can already tell it's built to last. Hard casing that can take a beating on the road. The mod feature is nice and adds a sparkly light chorus touch on top of the effect. Controls are simple and the knobs are quite responsive. I recommend this to all delay lovers. Hope this helps! I use this for vocal slapback in lieu of a the roland space echo i'm blessed with using if i am in a friend's studio, but this little pedal gets the job done for live performances. personal favourite settings are: regen 930, mix 11, delay 10. great for that vintage delay, however not as spacey as the roland. Turning up or down the knobs each mm you can ear something is happening. This is not something you can find in other pedals for the same price, it's super responsive, dynamic, dark and glitchy sometimes. It doesn't sound like a tape echo but it has its own distintive sound, that in my opinion is something you can't say for tons of pedal. Before the Gain section it creates echos and atmosphere. highly suggested for super short delay times to add "body" to your chords. Use it for a nice rich trail to creat ambience in certain parts of songs. Works a treat. Looks great too. This pedal gives a player many sonic possibilities. Having just gotten it, I have immediately found several useful applications in originals. Very easy to use, solid MXR construction and highly versatile. Sounds great, easy to use, and looks awesome! Excellent small analog delay pedal on a resonable price.